This chapter starts with a brief outline of the historic development of the interspecies relationships and discusses the role of norms in changing behavior. Norms play a role in maintaining the ideology of carnism which enables people to eat the flesh of certain animals due to the invisibility of meat production and to the mechanisms of objectification, deindividualization and dichotomization of livestock. According to the meat paradox theory, people alleviate the unpleasant feelings about eating animal flesh by diminishing the minds of the eaten animals. The 4N (normal, natural, necessary and nice) rationalizations which justify eating meat in current society are also pointed out. Furthermore, the role of values, attitudes and different type of motivations are discussed. In conclusion, possible ways of employing community-based social marketing are offered. 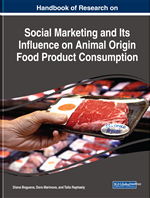 Current studies, concepts and theories on the issue of meat consumption are introduced below. They can inform possible ways for marketing campaigns to help people get their behavior in line with their attitudes. Community-Based Social Marketing: The use of marketing techniques and strategies which engage the whole community and involve direct contact with people. Social Marketing: The use of commercial marketing approaches to guide people towards adopting a new attitude, value and subsequently behavior in order to find a solution to a social issue at the level of the individual or society; it is marketing for the greater good. Veganism: A way of living which seeks to exclude, as far as possible and practicable, all forms of exploitation of, and cruelty to, animals for food, clothing or any other purpose. Social Norms: The rules of behavior considered acceptable in a group or society. Carnism: Prevailing ideology which conditions people to support the use and consumption of animal products, especially meat. Cognitive Dissonance: The mental discomfort experienced by a person who simultaneously holds two or more contradictory beliefs, ideas or values. Rationalization: The action of attempting to explain or justify behaviour or an attitude with logical reasons, even if these are not appropriate.